Windows 8 has managed to gain share steadily and slowly and Vista,the disastrous kept losing it's share.And now Windows 8 has replaced vista for the fourth most popular operating system in the world.Windows 8 was received with different emotions by the people at first but time has managed to do the trick.Users are getting used to the new Modern UI which replaced the start menu.It is a good sign for Microsoft. 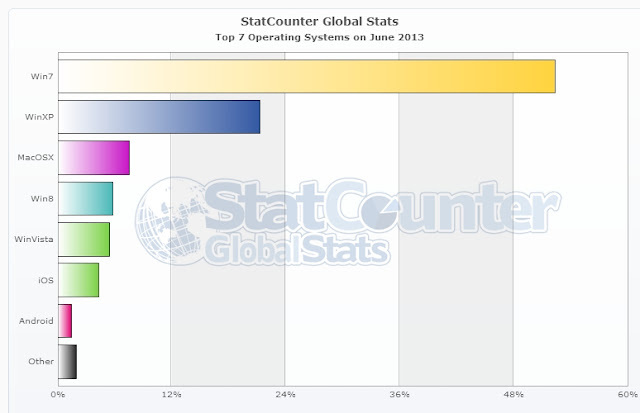 Currently Windows 8 powers 5.76 % of PC's while vista is installed on 5.44%.Windows 7 the clear leader with 52.34% while the 11 year old OS Windows XP used by 21.27% of computers.Now Windows 8's next aim is Mac OS X.Mac has 7.56% of share and Windows 8 moving up steadily will catch apple's OS around next year's start. But don't take it for granted as Windows 8.1 is in the bay which may accelerate the market share Windows 8. So what do you think friends ? Will Windows 8 take over Mac OSX? Let's wait and watch the changes when Windows 8.1 comes out !